What makes one restaurant stand out from another? The food, of course; the service, crucial for achieving excellence. But what makes the clients want to recreate this experience with the best flavours is the environment. The layout of the space is also essential for when it comes to sampling a dish, given that the comfort and the atmosphere can make a big difference. In this article, our restaurant in Palma, OMBU, will be explaining all about the decor of our creative tapas venue. For the all-round design of our establishment, we can thank Pedro Scattarella, from the design studio Dissenyados Arquitectura. Scattarella wanted to incorporate the outdoor surroundings of our restaurant in Palma, located in the Plaza de la Reina, next to the Borne, in to the interior. The old town of Palma is unmistakeable. Its narrow and cobbled streets are part of this cities dream like charm. That is why the studio brought to life the essence of the street in an extremely intimate surrounding. OMBU is a square in itself. Where cultures merge and flavours entice. The main star which guides us through every inch of the interior of our restaurant in Palma is a tree: the Ombú, a lush tree which grows in abundance in South America and offers shelter and refuge to all of its diners. The branches of the tree will guide us through a journey around the interior of our restaurant where we can differentiate and recognise the different parts of the square. When we cross the main door we find a bar in the shape of a boat on its side which navigates us to the kiosk of the square. This second location has a copper roof and contains our kitchen and where the magic of our dishes happens. This way, all of our diners can see the work created by our chefs, they are left in awe by the high class skills and demonstrations. When we head towards the dining area, we find the typical benches from the square, made with stone from Binissalem and marés limestone, two of the most well known and most used stones in Mallorca. In this space you will also see our roundabout which acts as a unifying area between all of the sections of the restaurant. Here you will also find the tree. Its steel branches roll out to display our lighting system, which welcomes in our diners. Finally, the floor is made with traditional cobble stones which are from the old train tracks which flowed through the square. Something which brings us fond memories of our Sóller Train Line. If we head up the stairs to the top floor, we see how far the Ombú extends. In this area we see the rigidness of its steel branches which contrast with the tree trunk. Here the floor is made of wood and the walls are plastered like the walls of the old white wash houses in the Balearics. In the final stretch of the journey, we find a large metal door which has hidden behind it the Sala Incognit. Through the rusted door we find luxury, once we enter through to this space, your gaze will be fixed on the room. 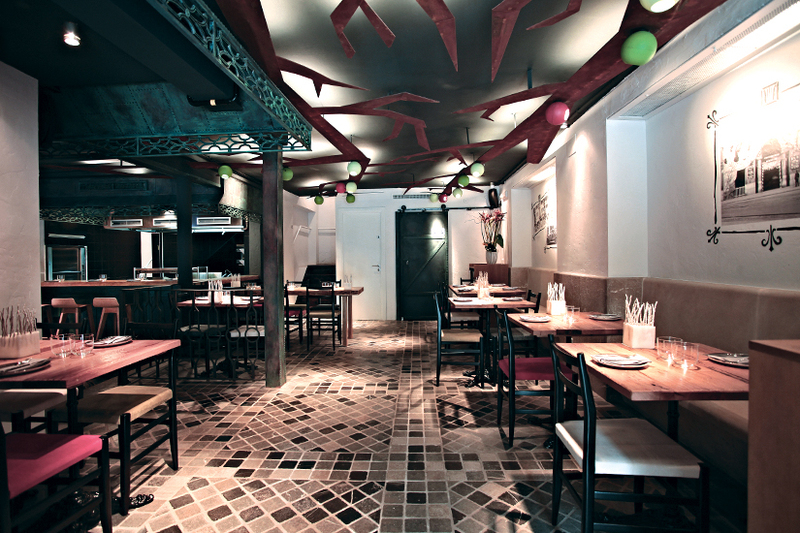 It is a large rectangular room which holds an elongated table with space for up to 10 diners. In its windows you will see gold leaf, which shimmers into the interior and adds a touch of exclusivity to the area, where you can gaze upon the Catedral de Palma and the Plaza de la Reina. If you would like to be carried away by the branches of our Ombú in the corners of our restaurant in Palma in a classic town square environment, you have the opportunity to reserve your table at OMBU. Our gastronomy will be sure to delight all of your senses.